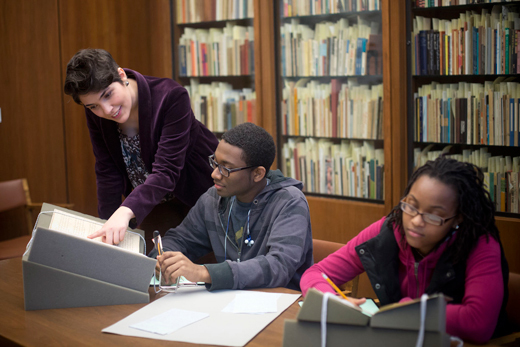 Using Emory's archives in an African American history class challenges students to think outside the textbook. Emory Photo/Video. Meeting on a mid-November morning in the African American Studies Seminar Room in Candler Library, the 10 students ignore the itch for the coming Thanksgiving holidays to discuss African American identity and its historical relationship to Emory. African American Studies History 338 is "usually not a course that involves trips outside the classroom," says instructor Sarita Alami. However, this fall Alami introduced a new element that expands the confines of the traditional course to use the resources of the Emory University Archives, housed in the Manuscript, Archives, Rare Books Library (MARBL), which includes a wealth of collections on African American and Emory history. "For the past several weeks, [the students] have been doing detective work in the University archives, unearthing documents that pertain to Emory's African American history and using them to reflect on their own ideas about race and slavery," says Alami. Seeing her students making themselves at home in MARBL, honing their historical analysis skills "has been a particularly gratifying consequence of incorporating archival work into the course,” Alami says, adding that it makes the subject come alive for the students and invigorates how the past is discussed in class. The students have compared working in the archives to putting together a puzzle. Digging through the papers at MARBL, they find African American history in old minutes from Board of Trustees meetings, diaries of former Emory students, and writings of notable Emory leaders. Their findings have been "quite remarkable," Alami notes. For example, in the antebellum era Emory students "held lively debates about the appropriateness of slavery." "Perhaps most importantly, the students have been engaging in their own debates about what it means to be college students in the South at an institution that has acknowledged its own involvement in slavery in recent years," she says. Alami's inspiration for constructing the course with archival work springs from her participation in planning a 2011 conference on "Slavery and the University: Histories and Legacies" at Emory and her work for the Transforming Community Project (TCP) from 2008-2010. "In the [TCP] community dialogues I participated in, we spoke a lot about Emory's race and labor history. In fact, some of my students participated in these same dialogues, so I'm lucky that they already had some background information about Emory's racial history," she says. Neekisia Jackson, a senior and history major, is doing her archival project for the course on Atticus Haygood, the eighth president of Emory, and his text, "Our Brother In Black." Early in the semester, Jackson was conducting research in MARBL when she read about how Haygood started organizations for the education of African Americans. That shifted her view of Haygood, from "Southern racist" to "relative radical." "Once Emancipation started…he was using his esteem and his wealth to help slaves, to uplift them and Christianize them because he was a Methodist bishop. He felt that through ministerial work and education, slaves could become great contributors to society," Jackson says. Freshman Jessica Ambroise learned the importance of critical thinking. "This class has shown me that … sometimes authors present information in ways that can be dangerous. When you only know half of the story, you cannot side with the other half. It is important that people understand everything before they choose a side," says Ambroise, exhibiting the critical thinking that Alami deems the most important part of teaching. "This class has definitely opened my eyes to the importance of outside information and looking at things with different perspectives," Ambroise adds. Toward the end of class, Alami asks the students, "How do you feel about doing archival work? How does it strike you? Is it just a pain to decipher [19th-century] cursive? Or is it something you'd want to do again?" Jackson, the senior history major, answers, "It wasn't that bad." She says she sees it as useful for her plans to attend law school and finds the firsthand accounts of the history of Emory illuminating. Adds Ambroise: "It made me feel like a detective in a way. I feel like there is something different about holding the original text. It makes you value more what you are doing." She feels that "being able to touch and see real artifacts and work added a level of depth and reality to the course."